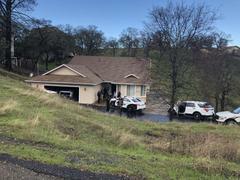 (Copperopolis, CA) On 12-16-18 the Calaveras County Sheriff’s Office received a report of subjects possibly living in or “squatting” in a vacant residence. Deputies initiated an investigation into the property located in the 4000 block of Edgewater Court in Copperopolis. Deputies were able to confirm that this residence was not “vacant”. Deputies made contact with the home owner out of county who confirmed that no one should be living at the house which contained a number of valuable items. During the early morning on 12-17-18 Deputies responded to the residence and were able to see two subjects inside. Deputies formed a perimeter around the property for the burglary in progress and made several announcements for subjects to come out. With no response from inside, deputies made entry and arrested two subjects from inside the house. The arrestees were identified as Larry Vannatta (age 44 of Copperopolis) and Cathryn Walter (age 45 of Angels Camp). Through investigation, it was determined that the two suspects had been living in the residence and numerous collectibles and property had already been stolen. One of the suspect’s truck was found in the garage with the bed of the truck loaded with stolen property. Deputies also located methamphetamine and drug paraphernalia. Larry Vannatta and Cathryn Walter were booked in to the Calaveras County Jail on charges of 460(a)PC-Burglary, 487(a)PC-Grant Theft, 594(b)(1)PC-Vandalism, and 182(a)(1)PC-Criminal Conspiracy. 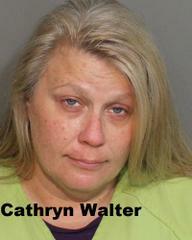 Cathryn Walter was additionally charged with 11377(a)H&S-Possession of a controlled substance and 11364H&S-Possession of drug paraphernalia. Her bail is set at $50,000. 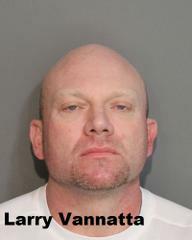 Larry Vannatta was additionally charged with 30305(a)(1)PC-Felon in possession of ammunition and 12022.1PC-Committing a felony while out on bail. Vannatta’s bail is set at $75,000. This investigation in ongoing. Stolen items still outstanding for this case have been described as sports memorabilia including clothing, Nascar memorabilia, and Disney memorabilia. Anyone with pertinent information regarding this case is asked to call Calaveras County Sheriff’s Dispatch at (209) 754-6500 to speak with a detective or our anonymous tip line (209) 754-6030. No further information is available at this time.